I know Hillsy and I have done things a little backwards (to most eyes), but then again that's what makes us us. Yes folks, baby daddy popped the question and of course I said yes!! We're set on having a non-wedding wedding. No frills, no Martha Stewart inspired extravaganzas, just a simple day strictly for the two of us (+seed). It certainly is turning out to be an action-packed year for us! ooooooh my warmest congrats !!! I couldn't agree more on doing things your own way & for having a non-wedding wedding ! You marry for yourself (both of you ! ), not for anyone else ! My bestest wishes ever !! I love it!!! It's gorgeous! So excited for you two! Congratulations--what an amazing year indeed!! 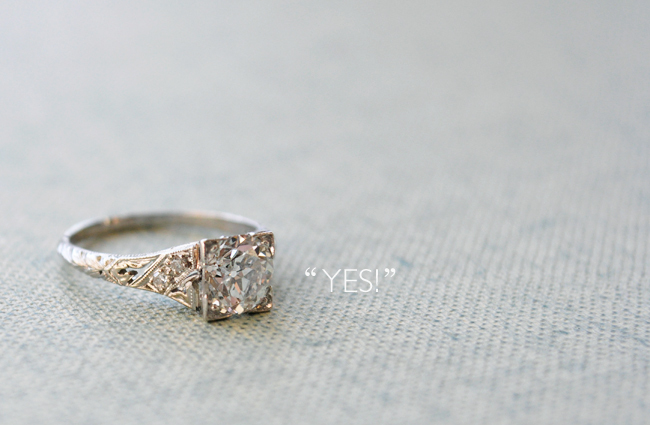 Your ring is gorgeous! Aww, congrats Marichelle, that's so wonderful!! And the ring - STUNNING. and the best is yet to come! congratulations! i love your ring! congratulations!! love and life always find a way - the order in which they come is as unique as your fingerprint! savor..... and kick your heels up! Congratulations! Wishing you a forever of happiness! Congratulations!!!! That is wonderful news! Don't worry about the order, the hubs and I did the same thing. We had our little bean and then had a very, very, simple wedding a year later on the beach in Tofino, BC, Canada. Lovely. No stress. Best wishes for a life filled with love and happiness - you deserve it! You guys are the best! Thank you for the encouraging words - here's to "doing it your way"!!! Mazel Tov Marichelle! Gorgeous ring too! Hi Liza, hope you and the bump are doing well!! Thank you so much Jena! Oh and it is vintage, I believe it's from the Edwardian era. Can you believe I'm preggers??? I know!! I still can't believe it myself!!! the ring is SO beautiful! hey mar+ jon: how did i miss this post? the ring is beautiful. you guys absolutely should do this :-) and no worries about the backward thing - that's what makes you unique! Your ring is so unique and gorgeous!! I LOVE IT! What's the story behind it? Is it vintage antique? Thanks Amanda! It is vintage. Unfortunately I don't know much about its previous owner. It was from an estate sale and apparently from the Edwardian era.